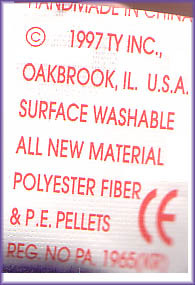 This section is for information related to the small plastic pellets contained in side of Beanie Babies. In 1998, Ty stopped using PVC pellets in favour of using PE pellets as these were considered to be more environmentally friendly. Beanies with PVC pellets tend to be more rare and often a little more valuable. This is especially true for Princess with PVC pellets. You can tell which pellets are in your Beanie Babies by looking at their tush tags! P.E. 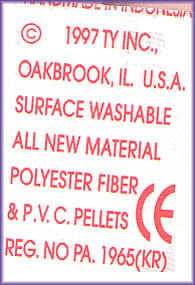 stands for polyethylene, and P.V.C. stands for polyvinylchloride! What do these pellets feel like? P.E. pellets feel like half of a sphere, and P.V.C. pellets are smaller than P.E. pellets, they feel cylinder but round on one side. 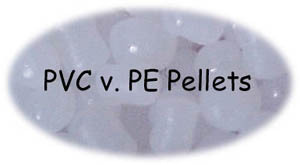 As a result of discussions between TY, the manufacturer of Beanie Babies, and Greenpeace USA, regarding the toxicity of PVC (short for PolyVinyl Chloride), TY has decided to use polyethylene pellets in all of its stuffed animals. This is a historic event - making toys less toxic and removing one more source of deadly dioxin from manufacturing and disposal (incineration) of PVC. PVC often produces cancer-causing vinyl chloride monomer, which is the base chemical from which PVC is made. In addition, the conditions under which vinyl chloride and PVC are made are perfect for the formation of dioxin, so that PVC is often heavily contaminated with this super-toxic chemical. Finally, if these PVC pellets are burned in an incinerator or fire, large amounts of dioxin can be formed. Dioxin is the name generally given to a class of super-toxic chemicals, the chlorinated dioxins and furans, formed as a by-product of the manufacture, molding, or burning of organic chemicals and plastics that contain chlorine. It is the nastiest, most toxic man-made organic chemical; its toxicity is second only to radioactive waste. Dioxin made headlines several years ago at places such as Love Canal, where hundreds of families needed to abandon their homes due to dioxin contamination, and Times Beach, Missouri, a town that was abandoned as a result of dioxin.